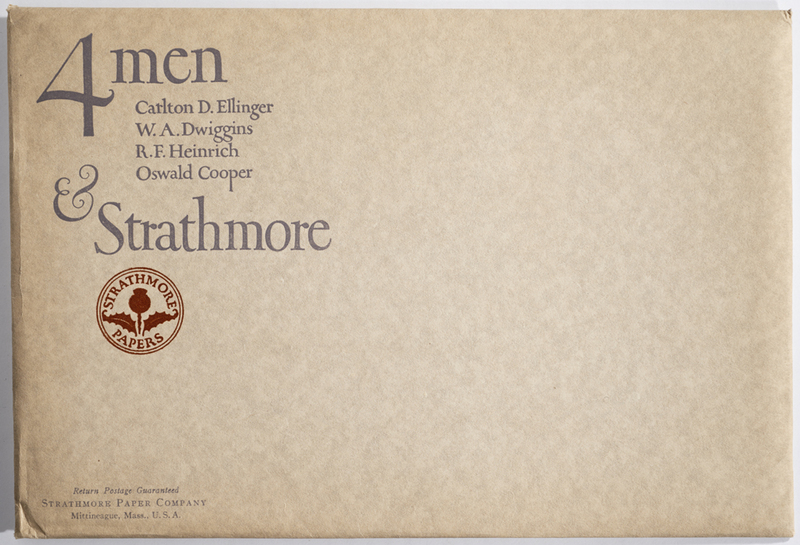 4 Men & Strathmore envelope (1923). Design by Oswald Cooper. Photograph by Annie Schlechter. Paper Is Part of the Picture portfolio opened up (Strathmore Paper Co., 1923). Design by W.A. Dwiggins. Photograph by Annie Schlechter. 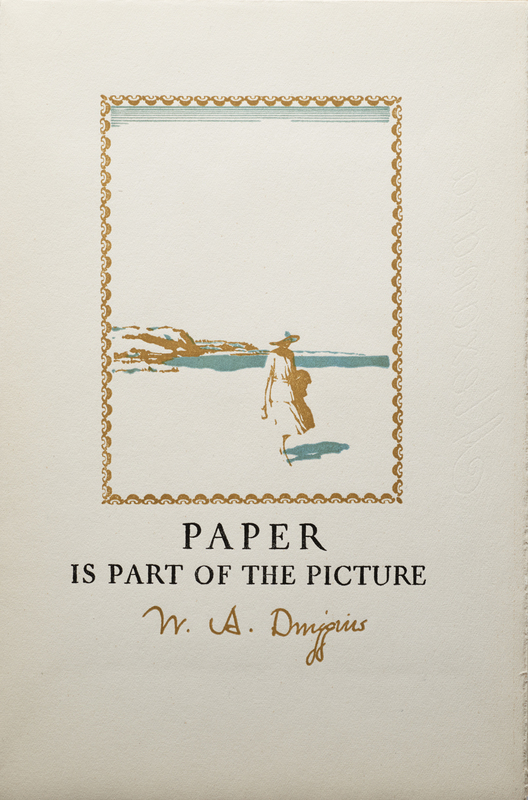 Dwiggins’ portfolio enclosed the four “treatises”: pen drawings by himself on Alexandra Book, lettering by Cooper on Blandford Book, a demonstration of color by Ellinger on Bay Path Book, and “the woodcut effect” by Heinrich on Old Stratford Book. 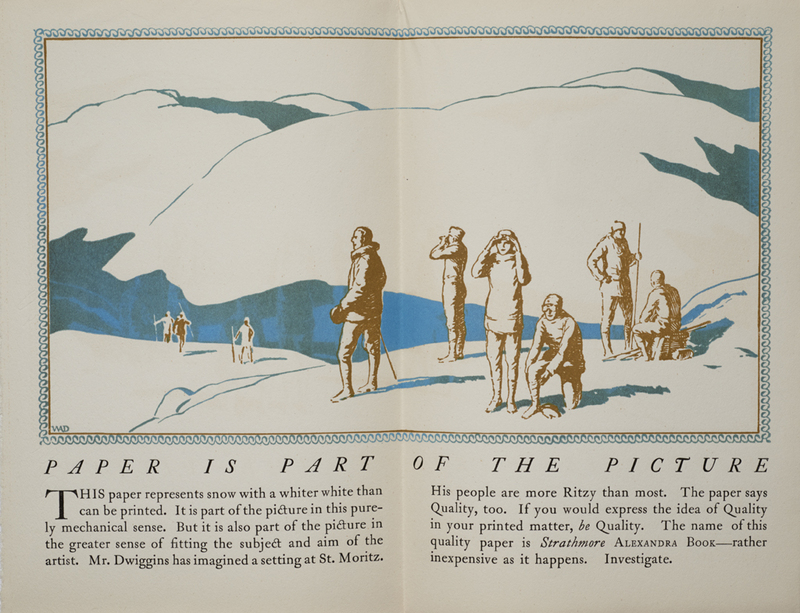 His two drawings (both in ochre and blue) used the paper as sand (a woman walking on a beach) and snow (an alpine expedition), two ideas that had already been exploited in the 1921 “Paper Is Part of the Picture” advertisements. 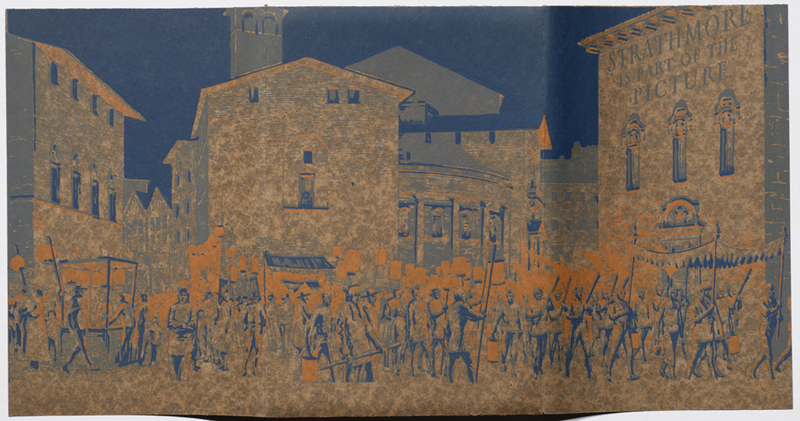 Paper Is Part of the Picture interior spread (Strathmore Paper Co., 1923). Design by W.A. Dwiggins. Photograph by Annie Schlechter. “Good Paper” (Strathmore Paper Co., 1923). Design by Oswald Cooper. R.F. Heinrich heeded Cooper’s warning, leaving nearly half of the front of his folder blank to prove that “The woodcut effect is partly paper”. But, the interior text contends, the effect cannot be achieved on any paper—only on an antique one such as Strathmore Old Stratford, which was introduced in 1898 in response to the Arts & Crafts movement. With it the folder is “the perfect blending of the work of a modern master of the woodcut with the modern counterpart of the antique book papers of old.” Unlike the Dwiggins folder, the Heinrich one stressed the tactile aspects of paper. 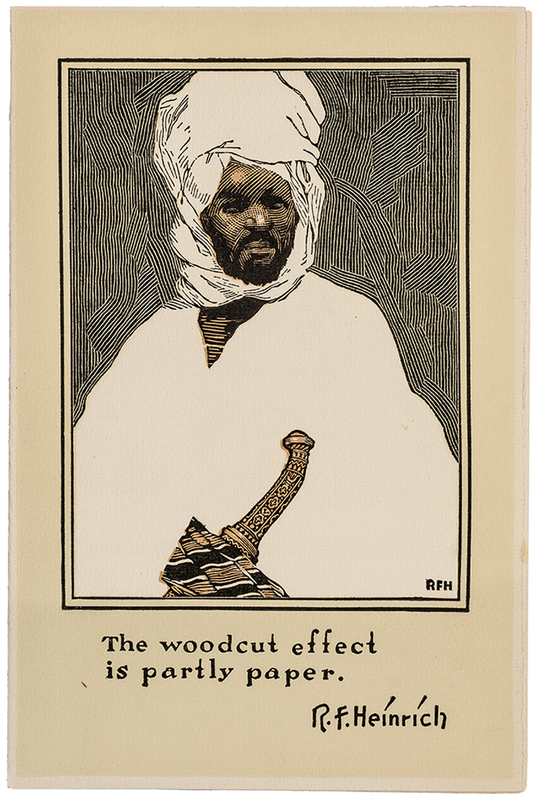 “The woodcut effect is partly paper.” (Strathmore Paper Co., 1923). Design by R.F. Heinrich. Photograph by Vincent Giordano. It is difficult to figure out the difference between the folder by Carlton D. Ellinger, the last one in the quartet, and the one by Dwiggins. 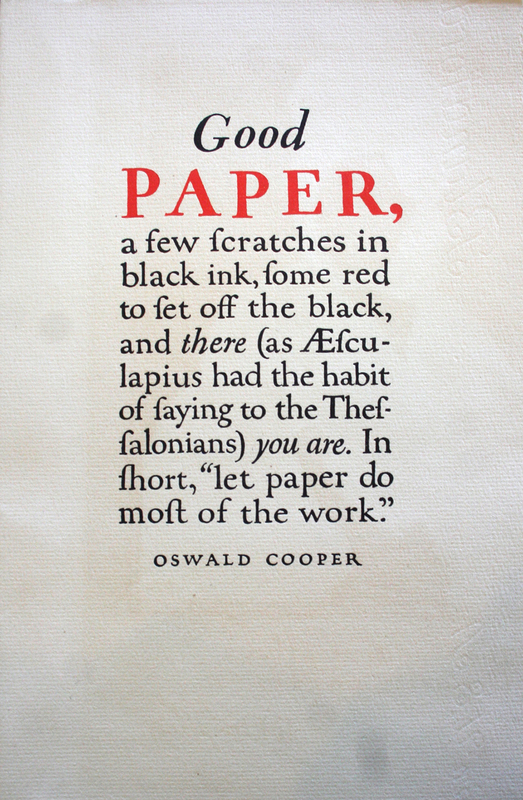 Ellinger’s drawing was promoted as an example of how to show off color with paper while Dwiggins’ was touted as a demonstration of pen-and-ink drawings. 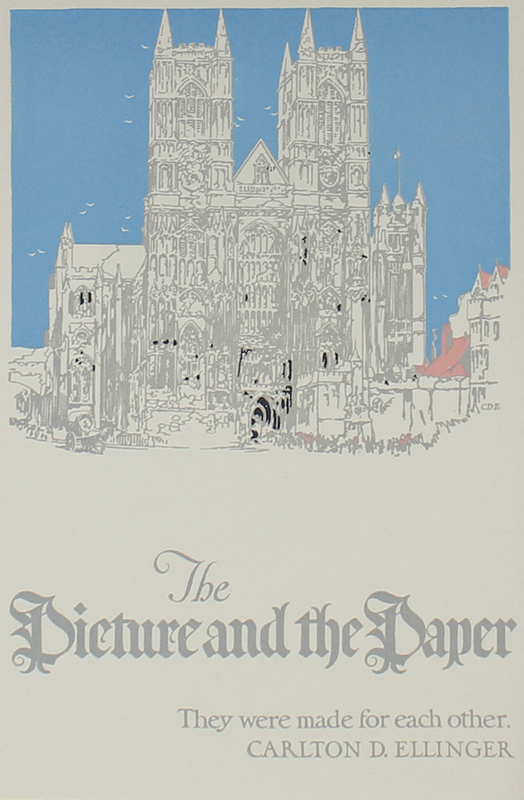 Ellinger used color for the background in his depiction of a cathedral silhouetted against a rich blue sky; Dwiggins used color for the subjects of his illustrations, the woman on the beach and the members of his mountain-climbing expedition. It is a subtle distinction that most recipients of the 4 Men & Strathmore mailer probably missed, but which did not diminish its impact. The Picture and the Paper (Strathmore Paper Co., 1923). Design by Carlton D. Ellinger. Photograph by Ariel Smullen. Paper Is Part of the Picture cover (Strathmore Paper Co., 1923). Design by W.A. Dwiggins. Photograph by Annie Schlechter. While the slogan “Paper Is Part of the Picture” continued in use for decades after this, the Strathmore Artists’ Series came to an abrupt end with the mailing of the 4 Men & Strathmore portfolio. It was replaced in Strathmore’s promotional efforts by the creation of Strathmore Town, an even more ambitious idea. Even though the Strathmore Artists’ Series ended in 1923, sone of the artwork created for it continued to be used by Strathmore in various promotional mailings throughout the 1920s. Furthermore, Dwiggins’ woman on a beach was used as clip-art by Strathmore’s customers. *I have replaced the long s with a regular one in transcribing the text.